Yeah, it'll be balmy over the weekend for the '500' festivities, but it ain't a thing over what it was like back in the other century, when peeps rolled up to IMS in covered wagons and ate hardtack and drank each other's sweat. And if you need more advice than that, here are some words to live by from IMS VP of Communications, Doug Boles, courtesy of the Indy Star. Even more here. Look. Seriously. Get out there, but be smart. DON'T make me tell you my dad's "lemonade story." P.S. 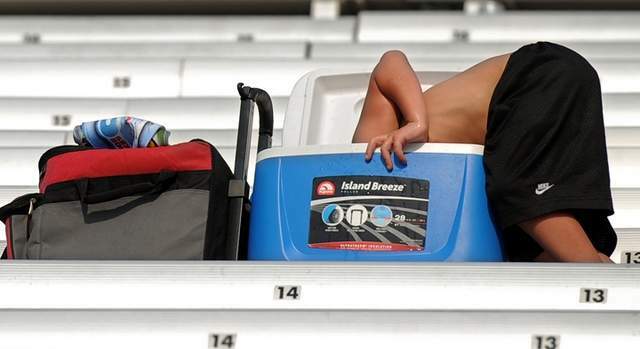 Got some advice of your own for ways to beat the heat? Please drop them in the comments section. Freeze *some* of your waters!